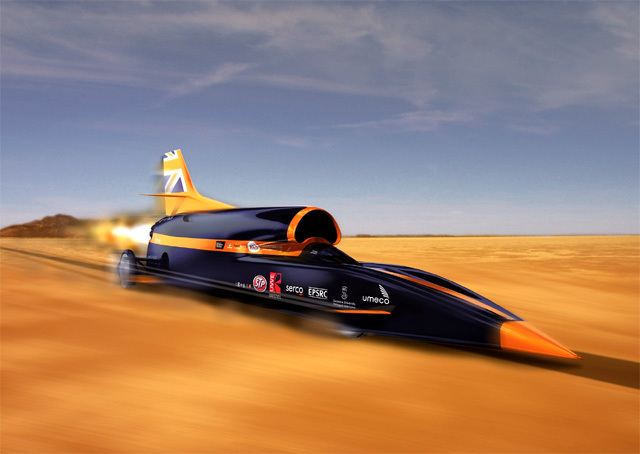 A British team is developing a car that will be capable of reaching 1,000mph (1,610km/h). 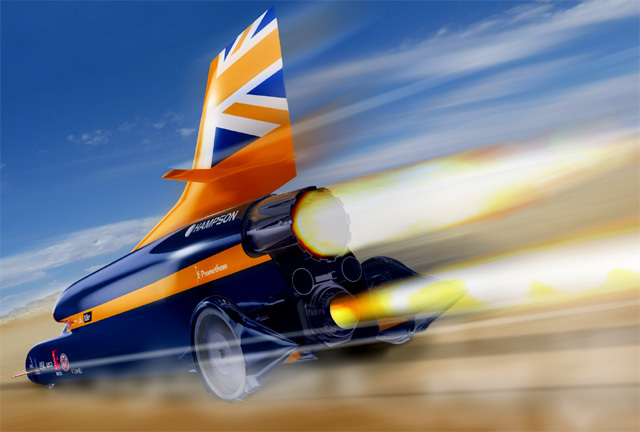 Powered by a rocket bolted to a Eurofighter-Typhoon jet engine, the Bloodhound SSC (SuperSonic Car) vehicle will mount an assault on the land speed record. The vehicle will be run on Hakskeen Pan in Northern Cape, South Africa, in 2014 and 2015. Wing Commander Andy Green, world land-speed record holder, is writing a diary for the BBC News website about his experiences working on the Bloodhound project and the team's efforts to inspire national interest in science and engineering. I have just returned from Singapore and a forum on Innovation, Technology and Design. The British Council and the British High Commission had invited an A-list group of UK companies to showcase the best of British expertise. 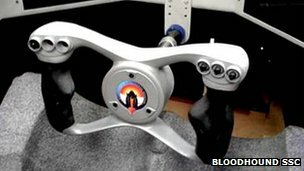 It was an impressive list, including McLaren, Rolls-Royce, Arup, Dyson - and Bloodhound. Singapore, and South East Asia overall, is facing the same shortage of engineers and scientists as we are in the UK. This is where Bloodhound is aiming to make a real difference and, based on the feedback from this conference, it's working. At the end of the event, the head of the UK's Technology Strategy Board described Bloodhound as "perhaps the best education outreach programme in the world". That's a huge vote of confidence for the Bloodhound Education Team - well done guys! If you haven't joined this (now officially world-class) education scheme yet, click here and do it today. 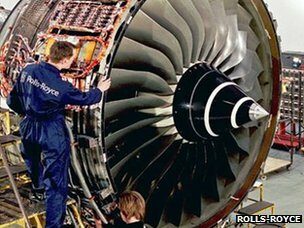 I also found out that Rolls-Royce assembles the Trent engine (for the A380 airliner) in Singapore. Here, we share some technology with them. The compressor disc (the bit you can see, with all the blades) is made by Castle Precision in Glasgow, and Castle is also leading the consortium of companies to make Bloodhound's 1,000mph wheels. While I was in Singapore, someone asked me if I was scared to drive at such high speeds. The answer is simple - Bloodhound is using the same technology as Rolls-Royce, so if I'm not scared to use it flying home, why would I be scared to use it on the ground?! 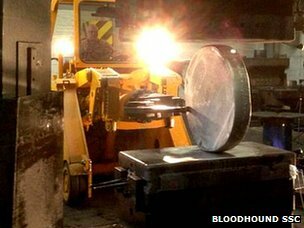 We were hugely privileged to go and watch the forging of Bloodhound's final batch of desert wheels this month. The forging process was done by Otto Fuchs in Germany and the exact process is carefully protected. We believe that we are the first people to be given media access in the 100-plus-year history of the company - it was a very special visit. We took a couple of the Bloodhound team, plus four engineers from Castle Precision (so that they could see the early stages of the process that they will finish off); and Top Gear Magazine came along to write about the world's ultimate go-faster alloys. The Bloodhound wheels have to support the car at over 1,000mph, at which point they will be rotating at just over 10,000rpm, or about 170 times per second. At this speed, the 900mm disc will be enduring a radial acceleration of 50,000g at the wheel rim. Imagine strapping a standard 1kg bag of sugar inside the wheel rim. At these speeds, it would exert a load of 50 tonnes, i.e. more than a fully-laden articulated lorry. In addition, we are aiming for a safety factor of 50%, if we can get it, to make sure that we can trust these wheels just as much as Rolls-Royce trust their engines! The wheels need to be seriously strong. The first thing we had to do was choose the best material. Previously, we looked at titanium (which is expensive and can be brittle under load), carbon fibre (which is unproven and can also damage easily) and aluminium alloys, which we used to set the current record back in 1997. Hence, aluminium was our preferred choice, provided we could find a shape that would be strong enough to cope with the 1,000mph loads. It's taken several years, several re-thinks and a lot of help from Lockheed Martin (UK), but we've finally designed a wheel that can use aluminium alloy without exceeding its strength. So which is the best alloy to use? In 2010, we tested various alloys by firing lumps of desert rock into the wheels at 1,000mph, to look a the worst case of a stone impact, but the results didn't produce a clear winner. Since then, we've done a lot more design work, which has led us to choose a new aerospace alloy, known as 7037. This is one of the 7000 series alloys (aluminium mixed with zinc) and 7037 is the best of the range for our wheel design. Trimet supplied the raw liquid aluminium to cast the initial "billets" (in this case, 280kg cylindrical blocks) that are the starting point for making the wheels. The 7037 melt was done specially for us, as we need about five tonnes of liquid metal to make 18 wheels - four sets of four, plus two spares for testing purposes. All the casting was done months ago, but that's only the start of the process. Cast metal is funny stuff and, as it solidifies, it grows tiny internal crystals. The structure of cast aluminium contains these crystals, or dendrites - tiny structures that look like microscopic Christmas trees. Think very tiny snowflakes inside the metal. To make the aluminium strong enough, we need to remove the dendrites, which is done by forging (squashing) the metal at high temperature and under huge loads. This is a bit like making a snowball - squashing the loose snowflakes together to make a stronger shape. This is what Otto Fuchs does, as a forging house, to make very high-quality forged wheels. Being German, they even have their own word for it: "Fuchsfelge" (literally "Fuchs wheel" - I think). The 280kg billet takes four hours to heat up to 390 C in a huge oven. The two-man team then has about 30 minutes to complete the forging before it cools down too much - so the pressure is on. One of them drives the manual arm to hold the block in exactly the right position for each forging operation, while the other one operates the 3,600tonne press. I counted well over 100 different operations on this quarter-tonne block, taking it from a cylinder to a cube to a large flat disc in under half an hour. It was like watching someone working Plasticine. A very large, very hot bit of Plasticine. The final result is a disc just over the 900mm diameter that we need. Once it's cooled down, there is a final bit of cold forging in the big press (yes, the 3,600 tonne press is "small" in this place - the big one is 20,000 tonnes). Throughout this process, there is also a huge range of quality control procedures, just as there are when Castle manufactures discs for Rolls. This is one of the key differences between aerospace and automotive engineering: around one out of every hundred alloy car wheels is tested for quality; for aerospace products (and Bloodhound) every one is checked. The discs are initially machined, then shipped off to the UK. On this occasion, the Top Gear crew kindly transported one of the first batch to Castle's Glasgow HQ in the back of the shiny new car they were testing. Once in Scotland, the extended wheel team will then take another three months to produce two sets of desert wheels. We'll keep the rest of the blanks available for modification, in case we have to make any design changes after our first visit to South Africa - this is an "Engineering Adventure" after all, and we don't know all the answers yet. The rest of the car is coming along well. The rear lower-chassis has been a major project in itself, and now that it's complete, the workshop team is pushing on with the rest of the build. I have also just got to see the final mock-up of the steering wheel, in position in the cockpit mock-up. We're going to use Additive Layer Manufacturing (also known as 3D printing) to produce a bespoke wheel, molded to my hands. Good news - thankfully - the shape fits my hands perfectly! The steering wheel has involved several of our engineering team at various points, plus some help from the Cambridge Design Partnership to finish the job off nicely - thanks guys. The design will now be finalized and then printed in titanium. Can't wait to see it. While my 1,000mph office needs to control the car and keep the wind out, it also needs to keep me safe. We're now working closely with the FIA Institute to review all of the cockpit safety aspects, with the aim of making this the safest Land Speed Record Car in history. I'm learning a huge amount about the nuances of crash helmets, seat design, harnesses, head restraints - you name it. If you're going to work at 1,000mph then you've got to get the details right.